Odisha has 62 tribes, the highest number among all States and Union Territories in the country, accounting for 22.85 per cent of the total population as per 2011 census. As many as 13 of these tribes have been identified as Particularly Vulnerable Tribal Groups (PVTGs), living in over 500 habitations of the State but mostly in hamlets inside the forested hills across Odisha. The Juang tribe is one of the PVTGs that belong to the Munda ethnic group and live in Keonjhar, Dhenkanal, Angul and Jajpur districts of Odisha and speak the Juang language, which is accepted as a branch of the greater Austroasiatic language family. Those who come down the hills at regular intervals have picked up Odia. It was to bring the Juangs into the mainstream that the Juang Development Agency (JDA) was established in 1975, with its headquarters in Gonasika Hills in Keonjhar district. Even after four decades have elapsed, the agency has not been able to go beyond the Juangs of Keonjhar. 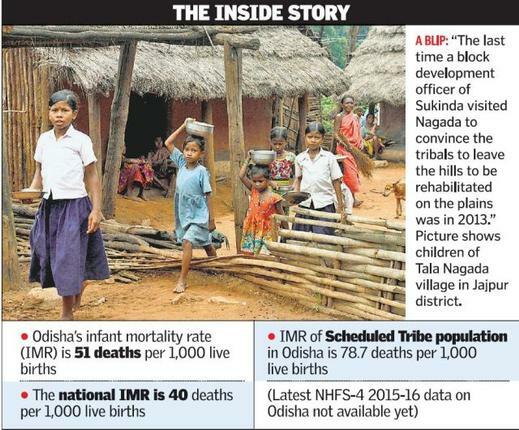 The tragedy at Nagada involving the Juang tribe exposes the government’s apathy towards the PVTGs, but this is not for the first time that malnutrition-related deaths have stalked the tribal children. In 2013, several malnourished Paudi Bhuyan tribal children had allegedly died of diseases caused by acute malnutrition in Lahunipara block of Sundargarh district, over 200 km away from Nagada. Following media reports about acute malnutrition among Paudi Bhuyan children, the State Women and Child Development Department, in consultation with Scheduled Caste and Scheduled Tribes, health and family welfare, rural development and panchayati raj departments, had prepared a guideline for a convergent health and nutrition plan to address the health and nutritional needs of PVTGs in the State. It is not geographical isolation alone, but exclusion of the tribals from many government programmes that has made hundreds of children suffer from acute undernourishment in Odisha. A coordinated approach by different government departments is the need of the hour to bring all PVTGs living atop forested hills in the State under the welfare programmes. The Classic IAS Academy is considered the Best Civil Services Coaching in Delhi. The Classic IAS Academy is aimed to develop amongst its students a competitive attitude along with sound academic base with quality teaching. It is also one of the top most IAS academies in India.